One question that often comes up in the context of leaving your corporate job and setting up your own business is this: Is it better to quit your job cold turkey so that you can be fully focused on developing the business, or is it better to build a business alongside your job? The truth is that there is no right answer, and it’s really a matter of your personal situation and preferences. There is a whole chapter in my book with stories of people who have taken ‘a leap of faith’ – they have left their jobs without knowing exactly what would be next and they have been able to dedicate themselves fully to finding that out. Of course, this option will likely mean working through your savings, making some compromises, and living with quite a bit of uncertainty as you try to find the right idea, first of all, and then get it up and running. On the other hand, kicking things off and building a business alongside your job means that you’ll have the security of a steady income (so no pressure to bring in immediate sales), it gives you a chance to both validate your idea and find out if you enjoy executing it, and it can be fulfilling in and of itself, even if you never end up pursuing it full time. (Check out some other benefits of starting a side hustle here >>). 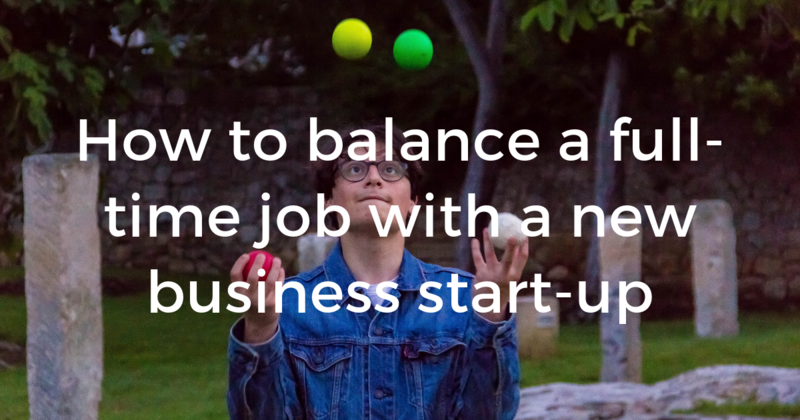 The disadvantage of this option is that you’ll have to balance a full-time job with a new business. Let’s face it, this is going to be hard work. You’re juggling not just a demanding full-time job but also everything else in your life, whether that be your relationship with your partner and seeing your friends, a young family, fitness, hobbies… Whatever tips and strategies I give you, we have to recognise that this is not going to be a walk in the park! Understanding why you’re doing this, why you’re adding something to your already full plate, is going to be incredibly important when it comes to motivating you and helping you navigate this intense time, knowing that you are working towards a really meaningful vision that you have for your work and life. So why do you want to start a business? And why now? How is your life going to change as a result of working on this business, and how will it change once you have it up and running? How does this business fit into your bigger vision for the future? How will you feel when you succeed? Why is this so important to you? Knowing your ‘why’ will keep you going when things inevitably get tough and when you have to make priority calls and compromises along the way. Speaking of priorities, it’s good to get clear on these upfront. Where does this new business fit in with the other important things in your life? While it’s not bringing in any income, you’ll probably need to make the call that your current job ranks higher in priority – so if you ever need to choose between one or the other, you’ll know that for now at least it’s the work that is generating income that has to come first. What about your partner and your children? Your health? Your golf sessions with your mates? Try to get as clear as possible on what you’re willing to give up – just in the short term! – while you work on setting up this business alongside your job. One image that has really helped my clients is this: when you’re juggling all these things in your life, you need to distinguish between rubber balls (which will bounce right back up if you drop them) and crystal balls (which will shatter into a million pieces). So, for example, your golf swing and your drinking buddies will probably still be there even after you’ve taken a few months off – your wife / children / hard-earned fitness level may not be! Another image is spinning plates: you can set a plate spinning and then head off to set another new plate spinning while the first one keeps going, but now and then you do have come back to maintain the first plate, or it will eventually stop and come crashing down. As important as your ‘why’ is from #1, you have to be self-compassionate and recognise that there are more important things – or, rather, people – in your life and sometimes you’ll need to take a step back. To find the time to work on your business and to make real progress, you’ll need to get organised. This means looking at your calendar and seeing where there are opportunities to cut back on wasted time or lower priority activities; where there are ‘dead’ time slots that you could use cleverly to be more productive; and what you can realistically commit to doing each day, each week. Consider your natural body clock when you do this, as there’s no point in planning to set the alarm for 4am if you know that you’ll never manage to roll out of bed at that time (and that your brain doesn’t function properly until after your mid-morning espresso), or working late into the night when you’re usually asleep by 9.30pm. Different tasks require different levels of focus and time allocation. For example, you can listen to business or self-help podcasts while driving or at the gym; you can connect with people on LinkedIn or Instagram on your phone while you’re waiting at the bus stop or in your coffee breaks; and you can grab a good old notepad and pen to brainstorm and plan your next steps while you’re commuting by bus or train. Strategy and planning require more energy and focus, and more time, than doing a bit of quick research or responding to messages. Decide when you’re going to work on your idea, plan where you’re going to do it (maybe create a dedicated space in your home for the more focused activities), and schedule it in your calendar as if it were an external meeting. Okay, so you’re clear on when you’re going to be working on your business; now you want to get clear on when you’re not going to be working on your business. The danger when you’re juggling a full-time job and a side business, and when the side business is a real passion project where you’re super motivated and engaged, is that you don’t know where to draw the line. As much as you love your idea, and as much as you’re committed to working hard to make it happen, remember all those other important things and people from #2. You still want to make time for the people that matter in your life, as well as taking much-needed time off to relax and re-energise. Set clear boundaries for when you’re not going to be on your phone messaging people or with your earphones plugged in listening to a podcast – for example, at the dinner table, at your daughter’s football match, or on your family holiday. Agree some ground rules with your partner. Use one calendar for work and personal priorities so that you have a complete overview of everything in your life and you don’t double book yourself or over stretch. And, importantly, get help when you need it – outsource admin and accounting, find a coach to guide you through the business-building process, and/or get a cleaner to help out at home! (You can also check out how to make work-life integration work for you >>). Once the initial excitement and energy of your first few weeks subsides, it will get tougher to keep up the motivation and keep doing the work consistently, so make sure that you build in these breaks and boundaries from the start so that this becomes sustainable. The inevitable disadvantage of building a business alongside a full-time job (and other commitments) is that you have less time to work on it. Things will move more slowly than if you were fully dedicated to the new business but that’s just the compromise that you’re making in return for the extra security of keeping your steady income. Remind yourself again of your ‘why’ from #1, as well as everything else that matters in #2, and keep in mind the bigger vision. You’re building a future here and that will take time – but it will absolutely be worth it, and you’ll have plenty of time to enjoy it once you get there. The good news is that small actions taken consistently will get you much better results than massive sporadic action! You might be surprised to learn that often when you have too much time to work on your ideas (yes, it’s possible! ), you end up being less productive as the hours and days just stretch out in front of you. Having to fit your business in around all your other priorities will make you much more focused and effective in the limited time that you do have. Be patient, keep taking action and you will see results – until the time when, if you want to, you can finally say goodbye to the job and hello to a full-time business! Are you looking to build your business alongside your full-time job? I can help you get crystal clear on your priorities, manage your time and energy effectively, and focus on the things that will actually get you the results that you’re after.